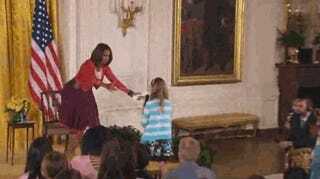 Via the NBC News tumblr: A buoyant exchange Thursday between Michelle Obama and the children of White House employees turned unexpectedly poignant when a young girl asked the first lady to help her dad. While other children asked Obama about her favorite food or color, the young girl handed the first lady a piece of paper and said: "My dad's been out of a job for three years and I wanted to give you his resume." The first lady immediately gave the girl a long hug. "Oh my goodness," she told her during their embrace. Obama then went back to her seat. "Well, it's a little private, but she's doing something for her dad," she told others in the room before looking at the girl again. "Right? Got it!" she said, holding up the paper.